Can anyone help me obtain a clean installer for CombineZP? CombineZP author Alan Hadley's site is not responding, and the alternate sites from which I've tried to download CombineZP seem intent on wrapping Hadley's CombineZP in layers of parasitic junk software. Ugh! I have a copy that I downloaded on 2014 Jan 30, which reports itself as "6th of June 2010". I've made that available to Chris S.
For clarity, when I wrote "heat up," I meant "gets really hot from continued, maxed-out processing." When computers are turned on but idle, they don't generate much heat. Also, it's easily possible that no other software you run pushes your machine enough to get it very hot, either. I've got a resource intensive DVD authoring program that runs like a charm. Not sure what you mean by "crash." If you mean that CombineZP freezes or quits, your issue is probably with CombineZP. But if you mean that the machine suddenly shuts down or reboots, this is almost always a heat problem. If the latter, I strongly recommend a torture test, which is very easy to perform, and neatly isolates such problems into either hardware or software domains. The PC doesn't crash. CombineZP crashes, announcing that it's stopped working. Any other running programs continue to run normally. My suggestion was intended as a quick and easy way of working out if it was a software problem. No problems, ignore the sites pop ups. I'll put the exe up somewhere if you like. Because I shoot raws it doesn't like my input files so couldn't test further. Did you try it as Windows 7 compatibility ? After replicating your crash experience many times, I may have a fix. Not certain yet, but so far, it's looking good (cranking through a 603-image stack of 24-megapixel jpegs), and it may hours before I know for sure: Try reducing the number of cores available to CombineZP. My current test is running on 2. To do this in the menu, it's File>Set options, then enter 2 in the second box down, labeled CPU usage. If 2 cores continues to work, I'll try 4. My machine has 4 true cores, and 4 virtual cores. Lots of other things don't work, including increasing the memory allocation or running the computer in Windows XP compatibility mode. Reducing pixel dimensions of the files makes the program fail after more images, but it still fails. I tried some of those things, but not with those settings. It sounds promising. Thanks for the information. In further tests, CombineZP continues to work flawlessly on my machine when allowed to use 2 or 4 cores, but invariably fails with 5 or 8 cores. (I didn't try other values, but don't see much need for this.) My CPU has 4 physical cores and supports Hyperthreading, which makes the operating system report 8 processors. My sense is that CombineZP doesn't play well with Hyperthreading, at least under Windows 10. Limiting CombineZP's access to the number of physical cores seems to side-step this problem. It's probable that not everyone encounters this issue, because many CPUs don't have hyperthreading (Intel i5 models come to mind). Symptom: Combine ZP hangs with the message: “CombineZP MFC Application has stopped working”. At this point, there is no choice but to close CombineZP. 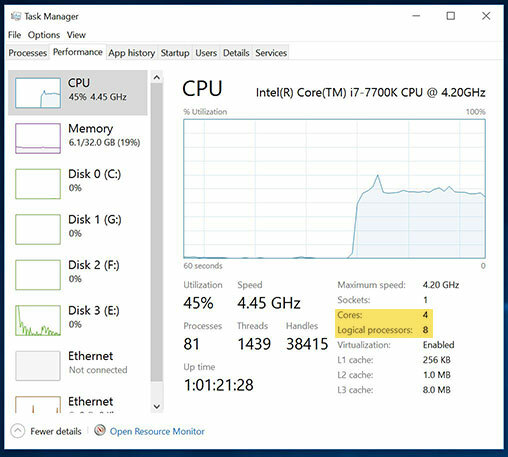 Solution: Limit the number of CPU cores available to CombineZP to the number of physical cores--not logical processors--on the computer's CPU. To reduce the number of cores available to CombineZP: In the menu, choose File>Set options, then enter the number of physical cores in the second box down, labeled "CPU usage". That's excellent work. I'll give it a try. How much memory did you reserve? What if any compatibility mode did you use? I tried a bunch of settings and it always crashes. I have 8gb of RAM. I had no other apps running. Are you getting the error message "CombineZP MFC Application has stopped working"? When running stably, I was using the default setting of 128 megabytes. None. I had earlier and unsuccessfully tried Windows XP compatibility mode. I have 32GB, and ran other programs such as Photoshop while CombineZP was running. Are you getting the same message I did when CombineZP crashes? At what point in the stacking process are you getting the crashes? Prior to changing the number of processors, I was not able to get through opening the input files, for my 603-image stack. How many physical cores in your machine? What numbers of cores have you tried in CombineZP? I got similar results. I tried everything from 64mb to 4096 (and more). It crashed at varying points, but always crashed. I tried Win10, 7 and XP. I suspect I'm going to have to buy more memory, but can't afford to at this time. Hopefully, I'll still be working in June. I get the same message. Where it crashes depends upon the memory settings. I once got it to do a single single stack out of "all methods". BTW - My system has four physical cores. I tried setting it to two and four. It died on "interpolating output". I'm going to drop it back to 2 cores and see what happens. Crashed at the same point. Dropping back to one core. Crashed at the same point Increasing to 512mb. Did Soft Stack with previous settings. Succeeded. Will try Weighted Average. Weighted Averaged succeeded. Will try Pyramid Weighted Average. Pyramiod Weighted Average succeeded. Will try Pyramid Do Stack. Pyramoid Do Stack succeeded. Will try Pyramid Maximum Contrast. Pyramoid Do Stack succeeded. Will try Do Stack again. Do Stack succeeded. Possibly failed the first time because the change to 512mb didn't stick when changed. I tried a fresh stack with the previous settings and it crashed numerous times. I finally switched to Win95 compatibility, 64mb of RAM and 1 core. All stacks were successful. Here's one of them. It's grainy because I wasn't paying attention and shot it at ISO 1600. A second stack, this time at 400 ISO. Windows95 compatibility seems to have done the trick.